Tixi Meter Modems are intelligent communication computers with a huge data memory, forward-looking comm architecture and internet technology. The 2 MB data memory is outage-proof and may be extended to up to 66 MB, which is more than enough space for your messages. Data and messages may be dispatched automatically via E-mail, Fax, SMS, or Express-E-Mail. Data may be sent to the Tixi Meter Modem, too, by means of E-Mail, SMS or Express E-Mail. The RTC may be synchronized via the internet. Equipped with short-proof M-Bus or S0 interfaces, Tixi Meter Modems are to be used at any site where power consumption values need to be readout, saved, processed or automatically dispatched. Thanks to it's reasonable price, this technology allows competetive solutions for data aquisition and remote readout. 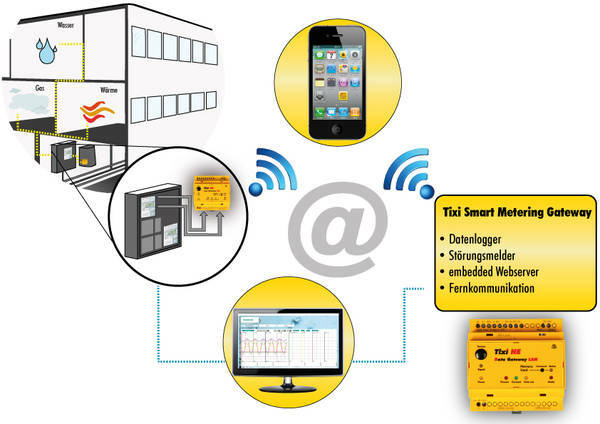 With Tixi Meter Modems, you neither need any software anymore to readout meter data, nor will there be need for retrieving data by modem, as Tixi Meter Modems will send these data automatically to you, using E-mail, Fax or Express-E-Mail - or dispatch it to a internet webserver for automated and remote interpretation. All meter readings and other values from M-Bus (DIN EN 13757-2/3, , EN 1434-3) or S0 (DIN 43864) devices may be recorded in logfiles, as well as any operating data of the Tixi Meter Modem. These logfiles may be dispatched to a central or several recipients as well (e.g. for the purpose of archieving or actual usage analysis). Thousands of meters, PLCs and Tixi Modems along with site documentation may be administrated by means of a SQL database. Logged data, eg. 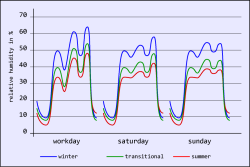 actual usage statistics, can be saved, analyzed and visualized here. Access is granted to authorized users only. The system can be easily adapted to custom needs and is open to external devices, too. e.g. every 15 minutes, every day, week, month etc. 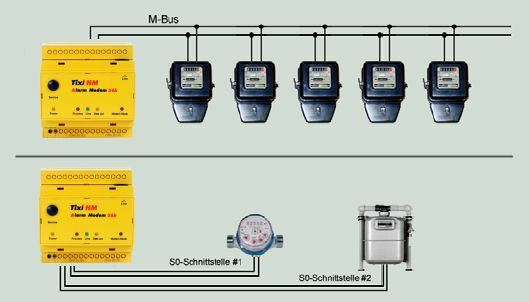 All common PLC protocols are implemented in Tixi Meter Modems already. Both devices are equipped with digital I/Os, suitable for connecting sensors and actuators. These can be read or set automatically by the Tixi Meter Modem. Using Tixi Meter Modems with two S0 interfaces, two devices may be connected and operated actively or passively. The Hx25-2S0 Models of the Tixi Hut Line are fitted with 2 x RS232, 3 I/Os and an analog input port, e.g. for connecting a temperature sensor. They can be extended to a maximum of 128 I/Os, using up to 8 Tixi Hut I/O modules. Tixi Meter Modems with shortage-proof M-Bus can connect to up to 25, 60 or 100 M-Bus slave devices. e.g. every 15 minutes, every day, week, month etc..